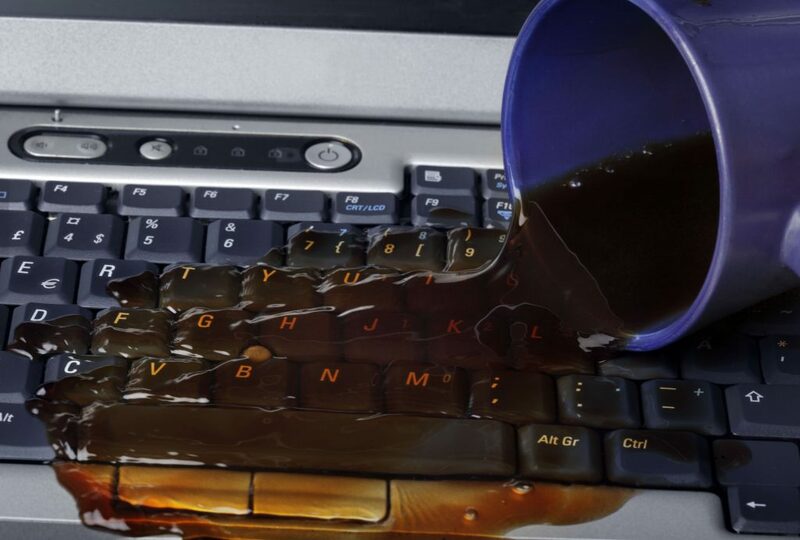 Laptop liquid spills are very common. Using our advanced liquid spill repair services you can be confident that your device will be up and running again.Usually, the type of the spilled liquid that is water, wine, beer,coffee, milk or soft drink. Stormwater damage cases are also common from floods. Unfortunately once a device is contaminated by the liquid, the entire device must be disassambled in order to assess the amount of the liquid contamination. Visual inspection by the naked eye is not sufficent as most board components are the size of a needle head. This is where we use our microscopes. To see each individual board component. We can see under and around the componets with ease. These components vary for each device. But in general they are, filters, IC, resistors, capacitors, diodes, ferrites, LCD connectors, bus, ram, smc, led drivers, PMIC. Once the faulty components are documented, we go ahead replacing each component according to its specification. Because we carry all components inhouse replacing most components only takes seconds. We can run micro jumpers, disable ports, trace lines, repair blown holes and basically whatever is required to get your logic board up and running. We are the leading experts in Australia for diagnosing and fault finding all logic board related issues. Ultrasonic bath electronic board cleaning only removes the liquid contamination that was on the logic board, circuit, board or motherboard. Ultrasonic bath board cleaning does not fix the problems associated with board components. We only use and recommend ultrasonic bath cleaning once the initial inspection has been performed and all the faulty or missing components are replaced. Because after completing the micro soldering works on the board there will be flux, alcohol, and solder lead remains left on the board. If these are not cleaned prior to testing, there is a high possibility of shortage and causing further damage to the board. With laptop liquid spill board repairs we do not cut corners. We remove the heatsink, clean the thermal compound and reapply thermal compound once the board is repaired. Brands we have experience working with are Apple MacBook, MacBook Air, MacBook Pro, Asus, Toshiba, HP, Dell, SONY, Gigabyte, Metabox, Alienware, Acer, MSI, Microsoft, IBM. If the liquid spill has been left unattended for a long period of time or, the previous ultrasonic cleaning that was performed was not done properly, this can lead to corroded components on the board. All corroded or burnt board component must be fixed and replaced in order for the device to work again. This is done by micro soldering each individual board component back onto the board. At Gadget Fix, we are the complete one stop solution when it comes to laptop liquid spill repairs. Because all work is performed by our trained expert technicians from the board diagnostics to micro soldering and ultrasonic cleaning, to testing. We do not need to outsource any of our work as we are the leading specialists in Australia. In fact, we repair other repair shops repairs. Our turnaround time is very fast as we stock all chip components, all board schematics in our workshop. Liquid spill recovery is most times possible if not late too late. laptop liquid spill repair is the same concept for all laptops. Macbook liquid spill repair requires expertly trained technicians. Laptops, computers, tablets, samsung smart phones. DJ and sound equipment, gaming consoles, navigation systems, car computers, efi computers, drones, monitors, medical equipment, IT equipment, general electronics, remote controlled equipment, photography equipment, cameras, recorders, amplifiers, tuners just to name a few. Inspection: This is the first and foremost important and crucial part of any repair. Our technicians inspect your device to see the spill damage, the extent of the damage. Parts Required: We will tell you exactly if any parts are required to repair your liquid affected device. Commonly its chips, filters, connectors, capacitors, and diodes. Written Quote: You will receive a written quote explaining the extent of the spill damage and what parts are required for the repair (if any). And how much it will cost for the repair. If you go ahead with the repair we will waive the service fee. If not the service fee must be paid upon collection. Next time you walk into a repair shop that charges you an inspection fee ($50-$180) for your water damaged MacBook Pro and still can not tell you whether if it is fixable or not or doesn’t even know what the problem is you would have lost a great amount of your money as well as your time. However, the system we have implemented in place is simple and works. A service fee of $69 (for MacBook’s) not only tells you if it is repairable or not, you will know exactly what parts are required for the repair and how much exactly the repair will cost. In other words, if you don’t go ahead with the repair all you have to pay is a mere $69 service fee. But if you decide to go ahead with the repair the $69 service fee is waived. So it is a win-win situation for you. At Gadget Fix, we have a “NO FIX NO CHARGE” policy on all liquid spill repairs. If we have given you a quote for your liquid damaged MacBook Air and you decide to go ahead with that repair and we are not able to repair it than there is absolutely no charge. We are honest, confident and experts in what we do and take great pride in our work. We make the “APPLE Geniuses” look dumb. Do not buy APPLE’s sales pitch of this Logic Board cannot be repaired and has to be replaced. We can repair any logic board. We have repaired logic boards with holes in it, burnt, broken, most components missing, partially melted, pest infected, saltwater damaged, ran over by a car, dropped from the highrise apartment just to name a few. We can replace and repair all components and parts that are affected by the liquid spill. We find that generally, the type of liquid is either water, coffee, milk soft drink or stormwater. Unfortunately, with any liquid spill, performing only an external clean is never sufficient enough. We guarantee our work by not cutting any corners and not using any cheap parts. Unlike many other repair shops who claim to do it all but outsource 95% of their work, at Gadget Fix Australia, we complete all repairs in-house, keeping the costs low, providing a quick turnaround time and reducing your point of contact to a single repair shop. Australia wide service available. Once your laptop is repaired all you have to do is pay for the repair. We offer free return shipping on all repaired laptops and macbooks.